Home>Music> Azealia Banks Trolls IG After Nick Minaj's Album Sales Rant: "My Career Is Finished"
The young rapper says she risks losing her "queen of beef" status. Nicki Minaj has been on most tongues for the past few days because of the release of her fourth studio album, Queen. The highly-anticipated record debuted at No. 2 on Billboard 200 after Travis Scott's Astroworld. A Twitterstorm ensued as Minaj went on a long rant listing the reasons why she was robbed of the top spot. Everyone and their mama have an opinion about how the rapper is dealing with her supposed failure. Azealia Banks joins in the fun. Azealia mentioned Nicki in one of her Instagram stories. The young artist alludes to the fact that the Queen rapper is on the same tip that Banks is notoriously known for. "Omg Nicki Minaj is trying to come for my Queen of Beef Status. She snatched My Beef wig!!" Yung Rapunxel makes fun of herself as she draws a parallel between both artists' behavior. 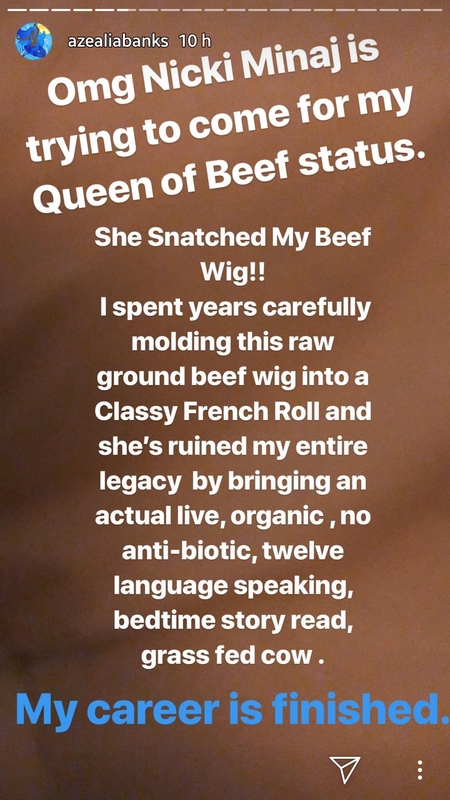 "I spent years carefully molding this raw ground beef wig into a Classy French Roll and she's ruined my entire legacy by bringing actual live, organic, no anti-biotic, twelve language speaking, bedtime story read, grass fed cow." The end is full of drama. Banks is obviously trolling a little but continued on a more serious note telling Nicki she should count her blessings. "See, nicki. 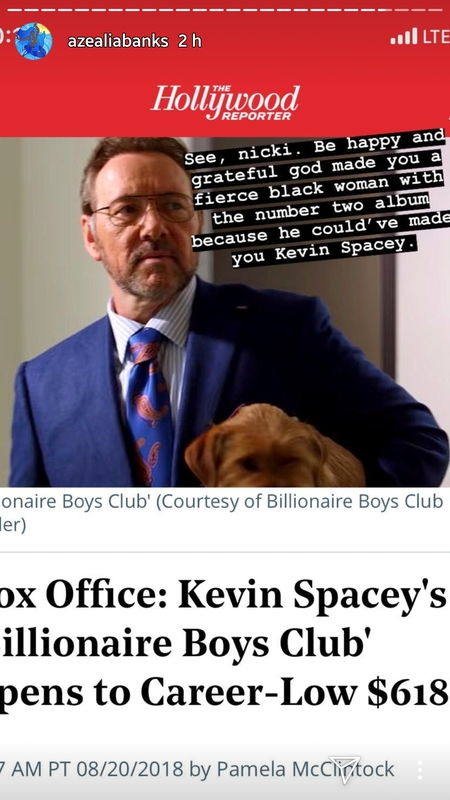 Be happy and grateful god made you a fierce black woman with the number two album because he could've made you Kevin Spacey." MUSIC Azealia Banks Trolls IG After Nick Minaj's Album Sales Rant: "My Career Is Finished"